MANILA, Philippines—Malacañang on Thursday said it would be up to National Youth Commission (NYC) chairperson Ronald Cardema to act on calls for his resignation following his controversial proposal to cancel the scholarships of students who join anti-government protests. 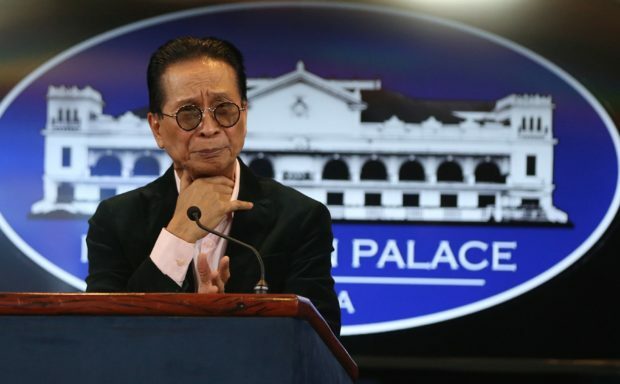 “Iyong call for resignation nasa kanya [the call for resignation, that is up to him], if he feels na he is still adequate, alam niya na kung ano ang dapat niyang gawin [he knows what he should do],” Presidential Spoeksperson Salvador Panelo said in an interview over dwFM. “Kung sa tingin niya nakakabigat siya sa administrasyon dahil doon sa kanyang mga kataga, eh alam niya rin ang gagawin niya [If he feels he becomes a burden to the administration because of his statements, he knows what to do],” he added. In a statement on Tuesday, Cardema asked President Rodrigo Duterte to release an Executive Order removing the scholarship of students with alleged links to the Communist Party of the Philippines, New Peoples’ Army, and the National Democratic Front (CPP-NPA-NDF). He also asked officials of the Sangguniang Kabataan (SK), the Reserved Officers’ Training Corps (ROTC), and the Citizen Army Training (CAT) to report scholars who are perceived to be members of the leftist groups. The proposal, however, did not sit well to some lawmakers who then called for his resignation. Sen. Francis “Chiz” Escudero, chair of the Senate committee on educations, said Cardema is bringing shame to the administration for being “ignorant” of the 1987 Constitution provisions on freedom of speech.